← Happy Independence Day, Argentina! Novelist Cecilia Velástegui’s newest book combines Andean mythology and the lives of contemporary women. 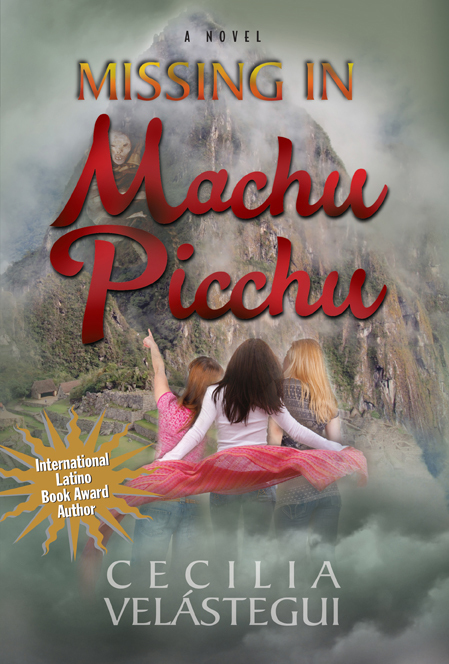 Missing in Machu Picchu follows four women as they hike — and face danger — on the Inca Trail. Her previous books, Traces of Bliss and Gathering the Indigo Maidens, also combine modern and historical themes. Her books have won honors from the International Latino Book Awards two years in a row. She won first place in 2012 in the Popular Fiction category for Traces of Bliss and she won Honorable Mention in the Popular Fiction category and first place in the Best Novel — Adventure or Drama category in 2013 for Machu Picchu. Velástegui grew up in Quito, Ecuador, France and California, where she currently resides. Q: Tell me about your book, Missing in Machu Picchu. High in the Andes Mountains on the legendary Inca Trail, four Ivy League educated, professional women embark on an adventure to help them confront their online dating woes — only to find themselves victims to a predator’s ruse, and in a fight for their lives. But, unbeknownst to the hikers, they have been under the vigilant presence of Taki and Koyam, two elderly indigenous women who understand the danger the women are facing. By following the wisdom of their mummified Andean ancestor, Taki and Koyam work to save the women and act with spine-tingling resolve against the sinister forces of Rodrigo and his minions. Q: What kind of research did you do for your book? Did you go to Machu Picchu and what was it like? Missing in Machu Picchu was a result of a confluence of events: my fond memories of my indigenous nannies from the Andes, our family’s unusual practice of believing in the present-day proximity of our long-dead great-grandmother, my understanding of the clash between the Inca and the Spanish cultures in early colonial Peru and its aftermath, and my experience hiking the Inca Trail. I recall foggy memories of the citadel of Machu Picchu when I visited it as a youngster. Then, in 2011, I returned for the festivities surrounding the centennial anniversary of Hiram Bingham’s expedition to Machu Picchu. It was a bittersweet time of appreciating how the travel industry and the popularity of Machu Picchu have greatly improved the local economy — and of reminiscing about all that was lost of the Inca culture. My lifelong interest and research on Andean mythology and its pantheon made its way to the forefront of Missing in Machu Pichhu. By mixing factual and real historical details, such as including the methodical steps of an Andean shaman’s blessing, I wanted to bring the reader into the Andean world of yesterday and today. For many years, I’ve studied the 16th and 17th century Spanish Colonial chronicles of Cieza de Léon, Juan de Betanzos and Garcilaso de la Vega. Their observations of the ancient Andean practices were both alarming and informative. In Missing in Machu Picchu, I included the 17th century drawings of chronicler Guamán Poma de Ayala. I knew of the existence of many of his drawings, but the drawing of the procession of the mallqui, the mummy central to my novel, had me digging in my collection and in libraries for quite some time. I’ve always considered myself a writer, but up until 2011 I was an unpublished writer. In college I received accolades for my writing, both fiction and non-fiction, but I decided to pursue a graduate degree in psychology rather than an MFA. Throughout the subsequent years, I attended numerous writing workshops, I became a marriage and family therapist, I raised two sons, I’ve had a long and joyful married life, and I’ve travel and lived abroad. The more disparate experiences I gathered in life, the fuller my basket of stories became, so much so that I was compelled to publish my first novel, Gathering the Indigo Maidens, in 2011. Throughout my life I’ve been a voracious reader of fiction and non-fiction in several languages, and I’m certain that all the authors have influenced me in one way or another.